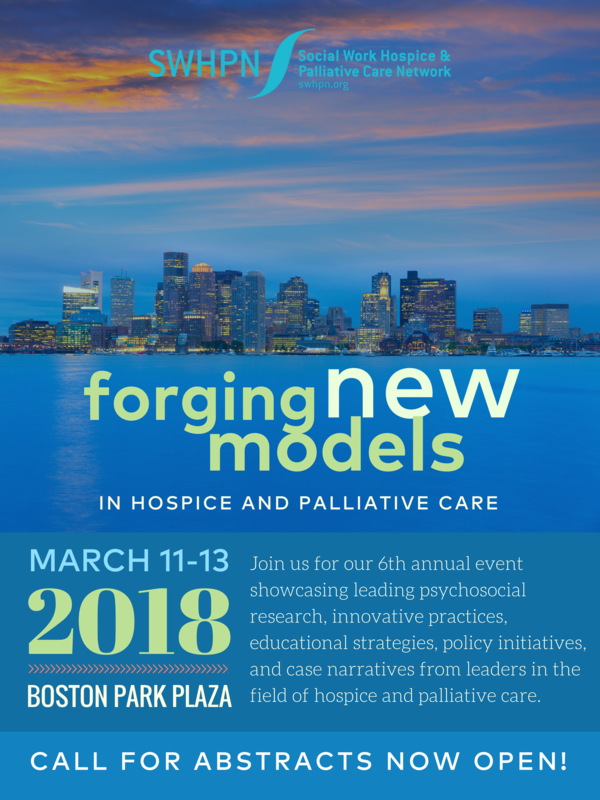 SWHPN 2018: FORGING NEW MODELS IN HOSPICE & PALLIATIVE CARE - THE CALL FOR ABSTRACTS IS NOW OPEN! We are pleased to announce, and hope you will join us, as we once again share the richness of our experiences and research together at the SWHPN 2018 General Assembly! The 6th annual event will take place March 11-13, 2018 at the beautiful Boston Park Plaza hotel, located just minutes from the Boston Common. The theme of this year’s conference is Forging New Models of Hospice and Palliative Care Through Practice, Research, and Education. We will explore new ideas, discuss the innovative ways we work, and create new models together, improving hospice and palliative practice for ourselves, each other, and those we serve. The 2018 Call for Abstracts is now open! You can find more information, and an abstract submission guide, on our website. The deadline to submit is September 1, 2017. Please feel free to circulate this announcement within your networks. We look forward to receiving your abstract submissions and to seeing you in Boston in March! Early bird registration opens September 5, 2017. Comments on " SWHPN 2018: FORGING NEW MODELS IN HOSPICE & PALLIATIVE CARE - THE CALL FOR ABSTRACTS IS NOW OPEN!"